Corsair is bucking the trend that labeling a peripheral as a "gaming" this or that and slapping on some LEDs amounts to a license to jack up the price. Gamers may be willing to spend more on high end gear than the average computer user, but does every peripheral have to carry an inflated price tag? Perhaps not, as evidenced by Corsair's new Harpoon RGB mouse and K55 RGB keyboard. 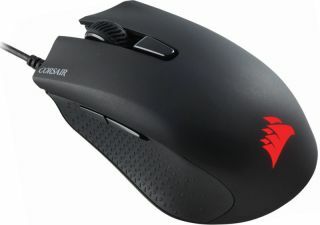 Starting with the non-furry rodent, the Harpoon RGB has a compact and lightweight body that's molded to fit naturally in the hand, Corsair says. It has a fine textured finished and rubber side grips. A 6,000 DPI optical sensor with "advanced tracking" and high-speed motion detection drives this thing. This can be adjusted on-the-fly down to 250 DPI. There are six fully programmable buttons using Omron switches rated for 20 million clicks. Using Corsair's CUE software, users can create macros for any of the buttons. RGB backlighting and on-board memory for saving custom settings rounds out the rodent. It's available now for $30 (£30) MSRP. Corsair's K55 RGB keyboard is a full-size plank with a dedicated numpad on the right and half a dozen dedicated macro keys on the left. It's not a mechanical keyboard, though Corsair claims the keys offer up "minimal noise" with a "satisfying feel without sacrificing performance." The plank has a three-zone RGB backlighting system with over 10 pre-configured lighting modes to choose from. It also has dedicated volume and multimedia controls, multi-key anti-ghosting, a Windows key lock, and a detachable wrist rest. Corsair's pricing the K55 RGB keyboard at $50 (£ 50) with it being available November 22. That'd probably be a home run if it came with mechanical key switches and per-key backlight adjustments. Unfortunately it doesn't, but assuming the keys are responsive like Corsair says, the asking price isn't too shabby. Combined with the Harpoon RGB mouse, the total cost is still under $100.